For months now, I’ve been promising my sister that I’d make some Monster Cookies. When I finally do, it’s during the month of December when red and green m&m’s are most common. 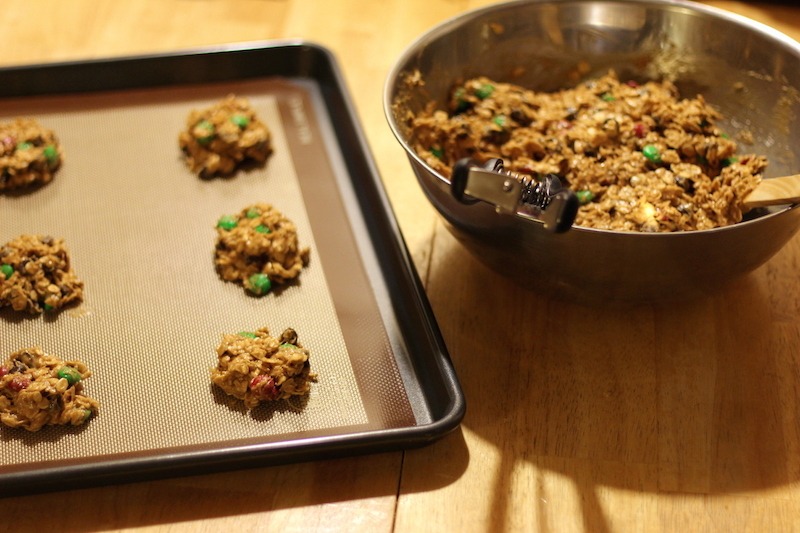 I think any sort of cookie baking goes hand in hand with the holidays so technically these are festive Monster Cookies. These cookies get their name from the amount of add ins you can mix into the peanut butter base. You can practically add whatever you want and much more, but I stuck to the basics (oats, chocolate chips and m&m’s). 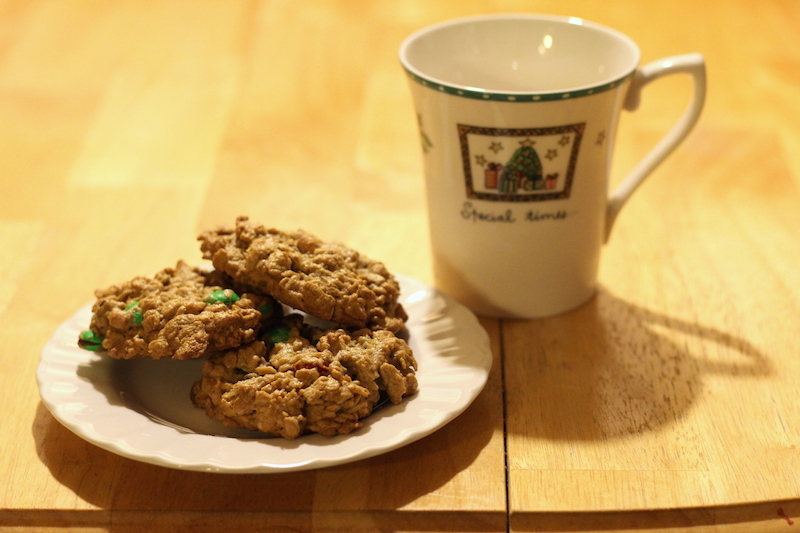 What I like most about this recipe is that there’s no flour, so it produces a chewy than crispy cookie. I prefer my cookies on the softer side so that’s a thumbs up in my book. I hope you all have a lovely day! Merry Christmas Eve! 1. Preheat oven to 350 degress F. Line baking sheets with parchment paper or silicone mats. 2. Beat together butter and sugars. Add eggs, vanilla extract, and baking soda, and mix well. 3. Mix in peanut butter until well-blended. Add oats and stir until combined. Mix in chocolate chips and M&M’s. 4. Drop cookies onto baking sheet by using an ice cream or medium-sized cookie scoop, about 2 inches apart. 5. Bake for about 15 to 20 minutes. 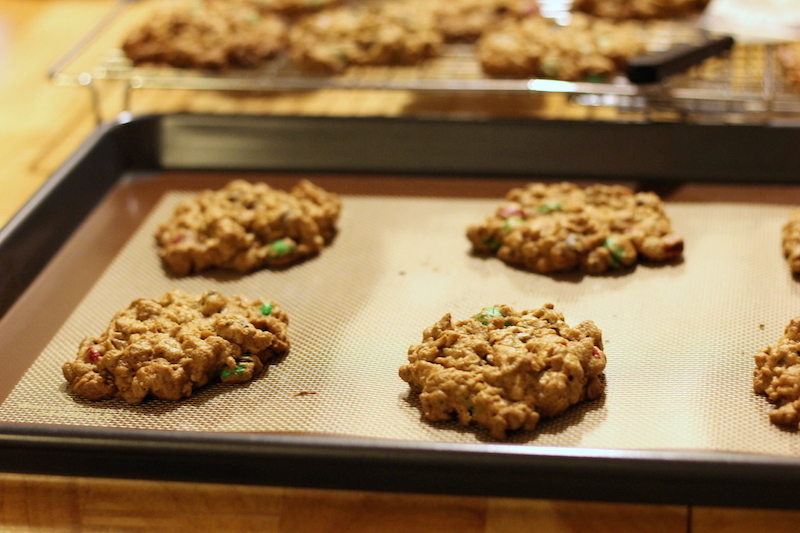 Let cookies cool on baking sheets before moving to wire racks.